As the boom of environmentally motivated arson and sabotage accelerated at the turn of the century it quickly became clear that the government, on behalf of their corporate sponsors, had a crackdown in the works. 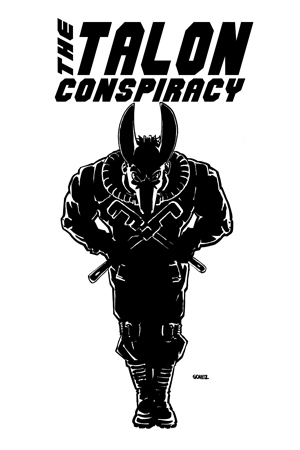 Unable to catch those responsible, the heat was turned up on support networks, spokespeople, and peripheral figures in the anarchist and radical wilderness defense communities. 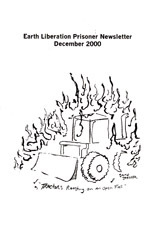 Grand jury subpoenas, congressional hearings, and new legislative efforts at repression seemed constant. 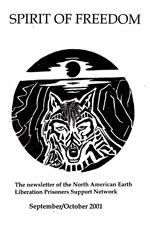 British activists, having long dealt with similar threats, began urging radicals in the US to start a support network for the inevitable arrests and imprisonment of eco-warriors. 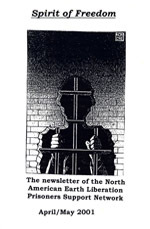 Working closely with Noel Molland (AKA Rabbix, publisher of R@T and Eco-Vegan) a young anarchist and former member of ADL New York named Daniel McGowan helped found The North American Earth Liberation Prisoners Support Network. 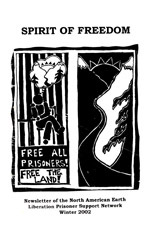 Their publication, Spirit of Freedom, soon became one of many excellent prisoner support zines coming out of the Northwest. 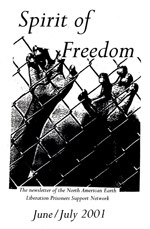 Covering all aspects of the movement and lending solidarity to a wide variety of struggles, Spirit of Freedom was a consistent source of revolutionary news and crucial support for our jailed comrades. As the decade progressed Daniel found himself needing the very type of support offered by the NAELPSN. 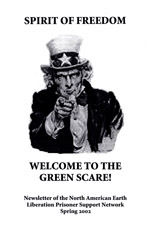 Arrested during the “Green Scare” (Ironically, a term Daniel coined on an early cover of Spirit of Freedom) Daniel is now serving a 7 year sentence in a Communications Management Unit in Indiana. Please visit his support site at www.http://www.supportdaniel.org/ for more information. Several months ago we posted Underground #16 along with the all caps tagline, “THE RARE FINAL ISSUE!” Boy, is our face red. The final issue of Underground is actually issue 17.